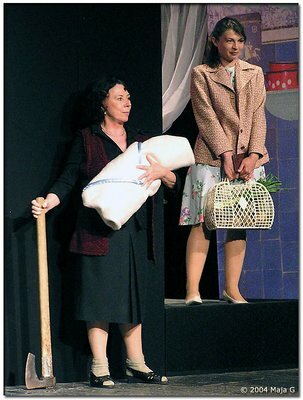 About A scene from the play "Pig's father", performed by Theatre Krusevac. Many thanks for commeting "Friends reunion"
I like a this image! wonderful work! NIcely composed shot... in difficult light condition i think... well done Maja! Lovely capture, good tones, clarity and display, very fine work. Hi Maja! I love looking at the costumes in stage shots...and I'm not disappointed here. Good design/comp to this. Good picture! Splendid! Bas juce sam i ja slikao balet i u SNP-u i bio u prilici da primenim nesto od svojih "pametnih" saveta. Priznajem nije lako, sve je jako brzo i mracno :-)))). Pozdrav iz NS-a. I like all your photos for the various shows and theaters, Maja. Thank you for your comment on my "Manneqin in green"
Super je. svidja mi se! Great work! !Nice scene.Beautiful colors and light. Fantastic shot Maja. Cheers my friend.